Since the 22nd of June 2018 the ilm maker from Penygroes, Mari Huws has been on a ten day expedition around the remote islands of Svalbard in the Arctic Ocean, with a crew of 18 scientists. The expedition is arranged by the University of Exeter to discover how extreme the situation of plastic waste is in the Arctic Ocean. Mari will be documenting the whole experience whilst traveling with the crew on the ‘Blue Clipper’s deck. By filming the experience Mari will be able to present their findings and the expedition to the public. Following concerns about plastic pollution in the sea, during their expedition they will be collecting data and information regarding marine plastic in the Arctic. 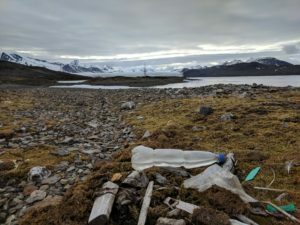 Because of its remote location and extreme conditions, so far there is lack of scientific research on plastic pollution. On this unique expedition the scientists and students from Exeter University will try and discover the level of plastic and micro plastics in the waters. Another aim by the crew is to unite the scientific world with the creative world to ensure what is polluting and damaging the seas is seen and made public. The hope is that by making it public changes will be made to policies. So far the crew have sailed around Svalbard, and have had adventures such as having to push pieces of glacier carvings off the deck. The crew witnessed whales, walruses, and even a close encounter with a polar bear. By searching for the website ‘Maybe Sailing’ you can follow the ‘Blue Clipper’ crew through their series of blogs on the website. The crew’s main aim of the expedition is to change policies, and so there will be a video chat with the Assembly on Tuesday the 3rd of July. The Minister for Environment Hannah Blythyn will be present amongst 10 other politicians in the Assembly to question Mari on the present situation. Mari will hold a live Facebook session on Hansh’s Facebook page on Wednesday the 4th of July at 7pm. The live session will capture a part of her period on the voyage and their findings. Through her live session viewers can see and discuss the amazing part of the world that is in danger, in the hope that it will raise awareness of the plastic problem in the Arctic. Clips of Mari’s adventures will be shown on Hansh’s Facebook page in August.